How Did I Do with Traveling? Some of you might be wondering: How did Doug do on his recent trip? As always, the Lord knew what He was doing. It turned out that the primary reason for me to write a blog about how to handle expectations during a trip (see July 11 blog) was not because my readers need to read it, but because I needed it for my own benefit! (Hopefully it was helpful to some of you, too). Allow me to explain. 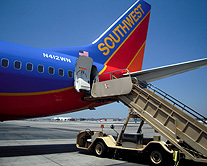 On the first leg of our trip we flew out of Burbank Airport (Bob Hope). If you’ve never been there, think of an airport that is locked in time to the year 1965. The first unexpected thing was my phone (with all my trip information, maps, GPS app, etc) was running out of juice. Try finding an electrical outlet in an airport that hasn’t gone through renovation in 50 years (I might be exaggerating, but not much). Fortunately, I found an outlet at the furthest edge of the terminal, behind some lockers. I had to wedge my charger with my suitcase, because it wouldn’t stay in on its own! But I calmly took a deep breath, prayed the Jesus prayer, and it was okay. Next, our late night flight into Chicago Midway was behind schedule. Instead of arriving at 12:15am, it got in around 12:45am. We hustled to the rental car tram (the rentals were now conveniently offsite) and we got to Hertz before it closed. However, there were two large parties in front of us and only one clerk. I was pretty patient – for the first 30 minutes. But it became apparent that either the clerk did not know what to do or the customers were making some unusual requests. By now the line behind us had grown to 6 customers – and they were all pretty irritated, since it was now 1:30am. What made matters worse was that a 2nd clerk, probably the manager, had poked his head out a couple of times but made no effort to help the poor guy at the desk. By the time, I got called up, I was pretty upset. I was tired, hungry, angry and confused. The Jesus prayer wasn’t working anymore (forgive me, Lord, I am a sinner!) and my flesh was getting the better of me. I complained rather loudly to the clerk and he calmly and quickly processed my order. To make a long story short, the two walk-ins in front of us wanted him to do things that were unorthodox (multiple drivers, multiple credit cards, hybrid car etc.) Strangely, during his explanation, God gave me grace and peace. I was able to let it go (or most of it). We finally got to our hotel at 2:30am and crashed. When I woke up, I realized that I was experiencing the very thing I had warned about in the blog – letting my expectations get the better of me. During my Personal Worship Time, God reminded me about holding things loosely, trusting Him to be in control, talking things through with Letty, and to remember to enjoy the “adventure.” In addition, I sensed that the unmet expectations and surprises would continue throughout the trip; so I better get used to releasing things to His care and Sovereign plan. The one big unexpected thing happened when we got to the Bicycle shop. 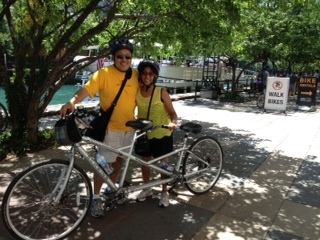 We wanted to rent a couple of bicycles to ride around the Lake Michigan beach front. It was a gorgeous day. But the shop was all OUT of single rider bikes. The only bike they had left was a Tandem – a bicycle built for two. Letty and I looked at each other, with a grin, and said, “Even better!” So for the first time in our lives we rode 20 miles around Lake Michigan on a bicycle built for two. It was so symbolic because for most of our lives, our journey has been like “a ride on a bicycle built for two.” I couldn’t think of a better way to celebrate our 31st wedding anniversary. And I guess, neither could God! Great blog! The bike for two – how cool is that. Am anxious to hear more about your time away. What an awesome story, Doug! We can learn by taking the word of God in but it is the ongoing life application where we truly learn to worship him, often through the act of stumbling. You recovered well and your story is inspiring; thank you! Happy Anniversary!